Many people have scalp problems! Daxxin can effectively relieve you of your scalp problems - such as dandruff and dandruff eczema, as well as a dry/irritated and itching scalp. To date there have been no reported negative effects, including problems related to dry/brittle hair or foul smells. Daxxin is available both with and without a mild perfume. Daxxin is free from silicones or colorants. Some products free from perfume. More than 100 000 persons have now tested Daxxín and become satisfied users! DaxxínToday Daxxín is recommended by dermatologists, skin nurses, pharmacists and end consumers. A reference list is available and references of different indications can be presented by request at info@daxxin.se. 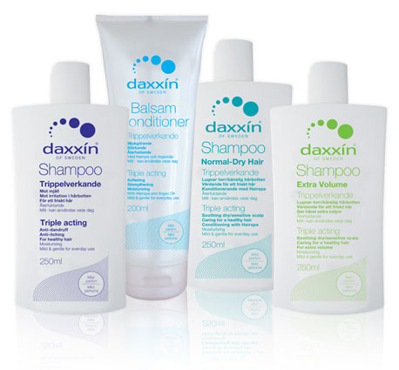 Daxxín is developed in co-operation with physicians, hair care specialists and chemists where the objective has been to develop effective products for scalp problems with mild and gentle resulting in both a healthy scalp and beautiful hair. Daxxín is only available at pharmacies and dermatology departments.